Experience Modern Dentistry’s Easiest, Most Profitable Way To Grow Your Practice (For Less Than 67 Cents A Day), GUARANTEED! Thank you for visiting to learn more about the benefits of being a subscriber. Marketing – What’s working now to attract and retain new patients? Dentistry Confidential® has been around nearly 20 years with subscribers from dozens of countries, reaching dentists all over the world. Dentistry Confidential® is a Level I service of Jerry Jones Direct. How often is a new audio program released? 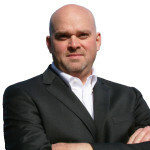 Each and every month, the CEO and Founder of Jerry Jones Direct, Jerry A. Jones, interviews, pokes and prods an expert who’s agreed to come under fire and reveal their best strategies, tips and techniques to run a more efficient, more profitable practice, with less stress and hassle. Around the 1st of every month, a new audio is released. It’s first released via streaming audio on our website so you can listen on your portable device (iPhone, Android, etc.) or computer. Then, about the end of the 2nd week, for subscribers within the US, a physical CD is sent via First Class Mail in a very distinguished envelope. Plus, every month, on the Subscriber website, a complete transcript of each audio is provided for download at no extra charge. Who has Mr. Jones interviewed? Our Founder and CEO, Jerry A. Jones, has literally interviewed hundreds of dentists and business experts alike for his monthly audio program, many of whom you’ll recognize instantly. He also regularly interviews dentists who’re on the front lines every day, working in the trenches as wet-gloved dentists – oftentimes, he will pull successful dentists from his own Membership (ClearPath Society® Members): folks like Drs. Sean Tarpenning, John Busby, Alan Rauchberg and most recently Shawn Van de Vyver. Audio learning remains one of the most robust and efficient ways to get affordable ongoing training in a particular subject. Dentistry Confidential® is no exception. Each and every month, you get a hand-picked expert interview delivered to your door and/or email inbox with no travel, no hassle and for very, very little invested. Just one thing said and converted to action, from one interview may well place your practice on the path to greatness. One little leverage point revealed may increase your income two-fold! You never know where the next bit of knowledge coupled with inspiration and example will lead you! There is no better, more affordable investment you can make in your business, every month, than listening in to Jerry as he peels back the onion, layer-by-layer, expert-by-expert, getting you to the heart of what will make you and your practice successful. No BS. No hype. Just straight-forward information and advice you can put to work today. How much is a subscription and how does it work? 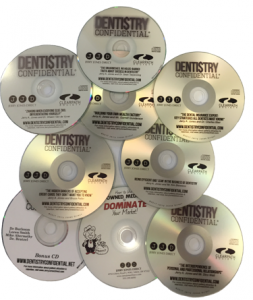 A subscription to Dentistry Confidential® is very inexpensive…coming in at under $0.67/day, or $19.95 per month. There are no long-term commitments or subscription requirements. Annual pre-pays are available. Pay for 10 months and receive 2 additional months at no additional charge. We also offer our subscribers protection against future price increases. What you pay now is what you’ll always pay as an active subscriber. Your monthly subscription (or annual pre-pay) never increases, unless you choose to relinquish your subscription and re-join at a later date. If you decide to, you can do so at the then-current monthly subscription. Do you offer a sign-up BONUS? Great question! You bet we do. In fact, we don’t just provide one bonus, but actually include multiple bonuses! 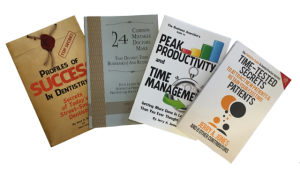 You’ll receive a copy of Jerry’s latest book (available on Amazon), Secrets of Street Smart Dentists…” and four audios – all in, a nearly $100 value, just for signing up. Jerry’s books and the four audios along with the current month’s audio will be sent to you via Priority Mail within 48 hours of you activating your subscription! If you opt for prepaying for 1 year in advance ($199.50), you’ll also receive a “grab bag” from Jerry’s collection of past audios. The value of this “grab bag” alone will exceed $199.50, in addition to the nearly $100 value above. For just $199.50 (pre-paying in advance for one year), you’ll receive nearly $300 in total value as a subscriber. Do you offer a Guarantee if I am unhappy with my decision? At JJD, every product or service we offer comes with our money back guarantee. With Dentistry Confidential®, you can quit at any time. If you are unhappy with your decision to subscribe, we will refund your last month’s subscription payment immediately and you’ll be under no further obligation. Plus, you keep any bonuses or CDs we’ve sent to you as our gift to you. What are my next steps if I want to subscribe? It’s easy to subscribe. You can click on the big SUBSCRIBE button below or, call our office. And, remember, there are no long-term obligations. Or, call us at 503-339-6000 and ask to speak to a Member Ambassador.